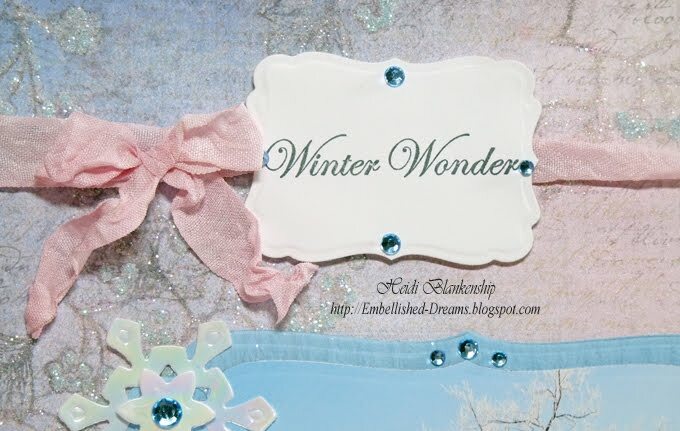 Spellbinders - JustRite Stampers - Winter Wonder Layout - Happy New Year 2011!! Hello! 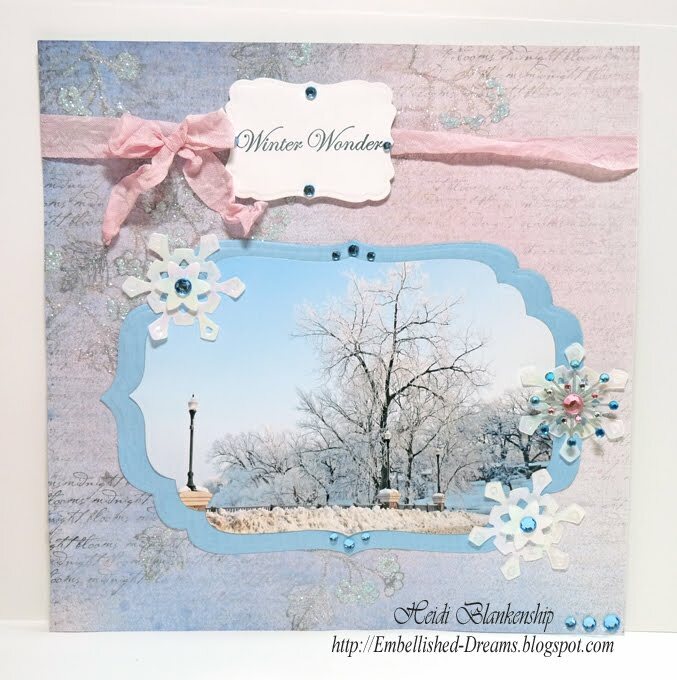 Today, I have a wintery layout to share with you. The past few days the trees have been covered with a beautiful crystal frost. It looks almost like everything was sprinkles with sugar--LOL! I started with a piece of My Mind's Eye paper from the Meadow lark Collection. Here is the before shot of the paper. This is the after shot. I added Waterslide Glimmer Mist and Cotton Candy Chalk. 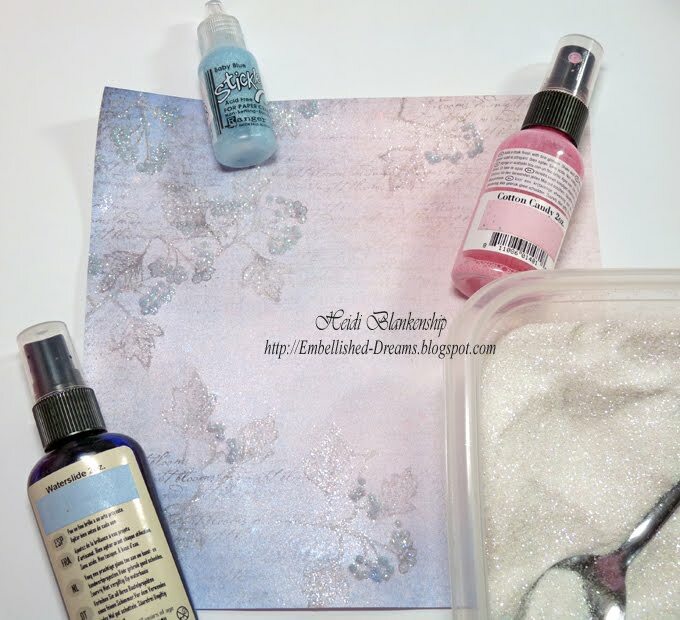 Then I used baby blue stickles for the flowers and glitter on the leaves. I love how this turned out and it totally changed the look of the paper. 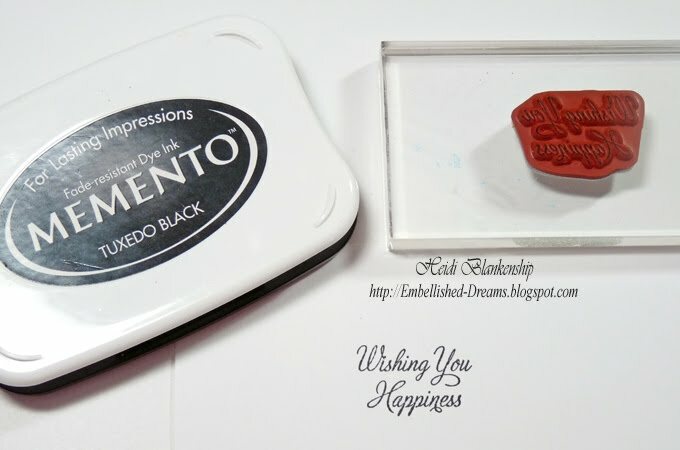 Next I stamped the sentiment from JB-09800 Nature's Nested Sentiments from JustRite Stampers with Tuxedo Black ink on to Simply Smooth cardstock. 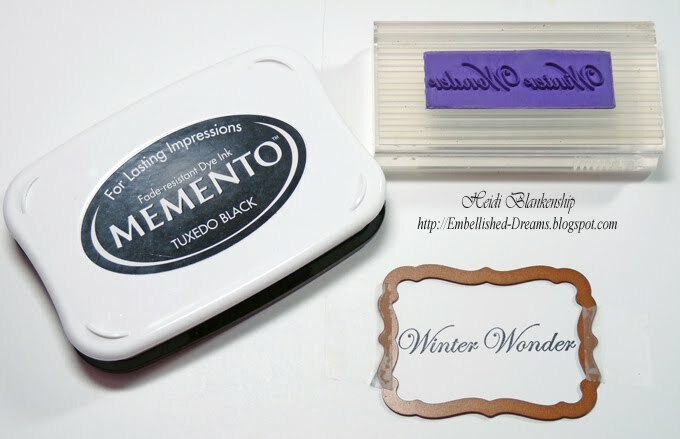 Then I used the Grand Calibur™ and S5-025 Labels Seventeen die #2 from Spellbinders™ to cut/emboss the diecuts. 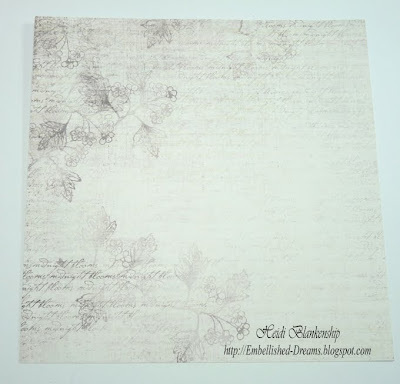 The JB-09800 Nature's Nested Sentiments includes 8 beautiful sentiments. Here is a close up of the sentiment. I added blue rhinestones and pink crinkle seam binding to the top of the layout. Here is a close up of the snowflakes. 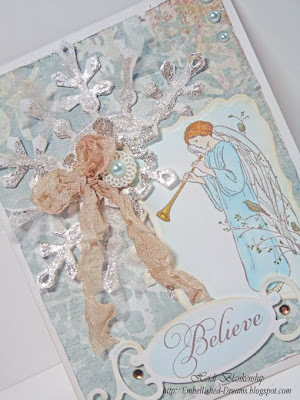 I used the Grand Calibur™ and S4-286 2010 Snowflake Pendants (small snowflake) to cut/emboss the diecuts. 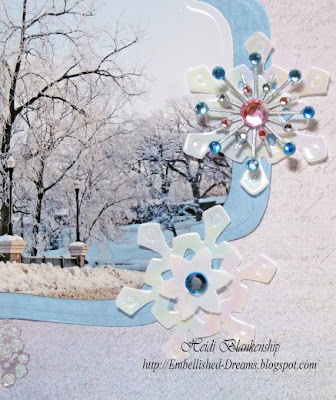 I used White Iris Shimmer Sheetz from Elizabeth Craft Designs for the snowflakes and then I added blue rhinestones. On one of the snowflakes I added a Sparkle Burst Brad from Karen Foster. To create the diecuts for the photo and the mat I used the Grand Calibur™ and LF-190 Grand Labels Four dies #2, #3. This photo is at a different angle so you can see all the glimmer and sparkle from the Glimmer Mist, Stickles and Glitter. If you are going out to celebrate for New Years Eve have fun but be safe!! I want to thank you all so much for subscribing to my blog and for all of the followers who come by to visit each day, for all of you support over the year and wonderful comments!!! I wish you Happiness and many Blessing in the New Year!!! Happy New Year--2011!!! Hello! 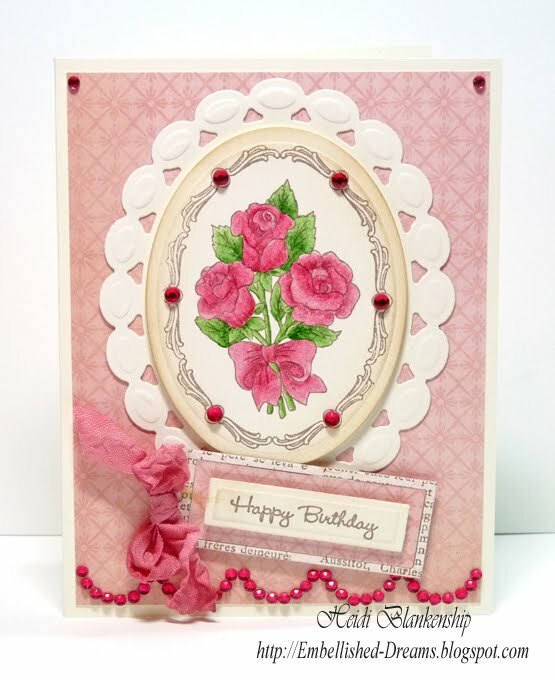 Today, I have a card to share with you using some of the fantastic New products from JustRite Stampers. 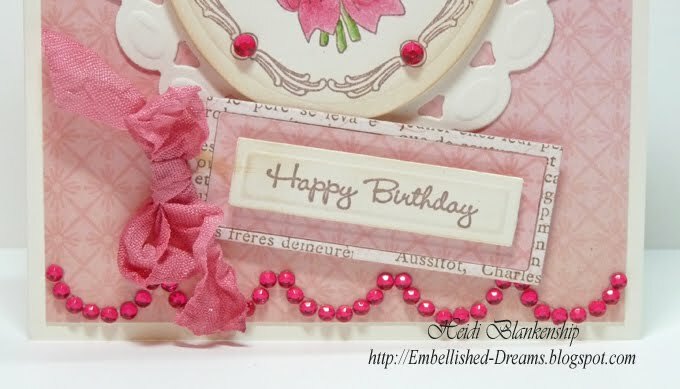 To create this card I used the New stamps from JB-09265 The Greatest Joy Set and JB-09820 Happy Everything Tag Making Kit from JustRite Stampers. The JB-09265 Greatest Joy Set includes 4 Centers (three beautiful floral & one sentiment) and 4 Borders. 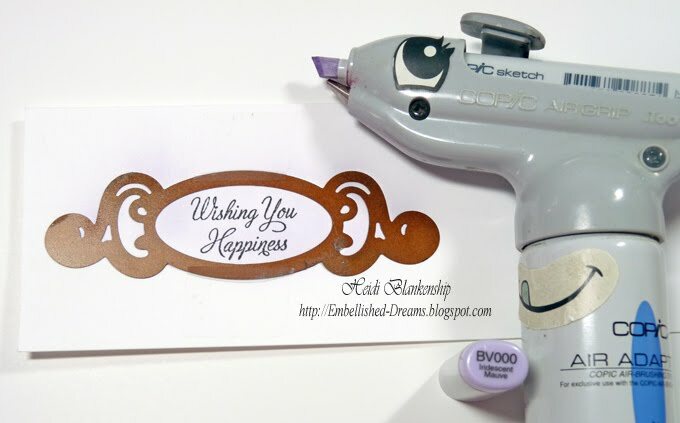 The JB-09820 Happy Everything Tag Making Kit includes 18 mini sentiments, 1 mini border, 1 mini clear stamper and 4 Custom Dies. 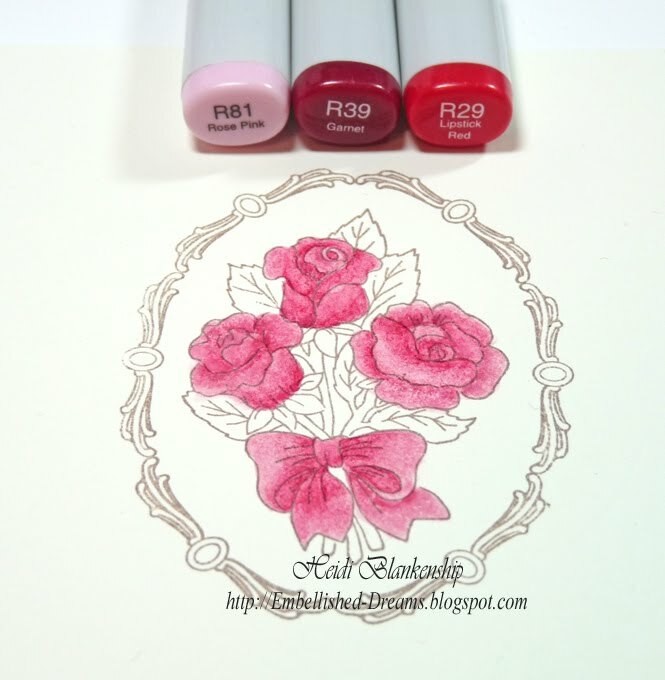 This is a great stamp set for all year round! 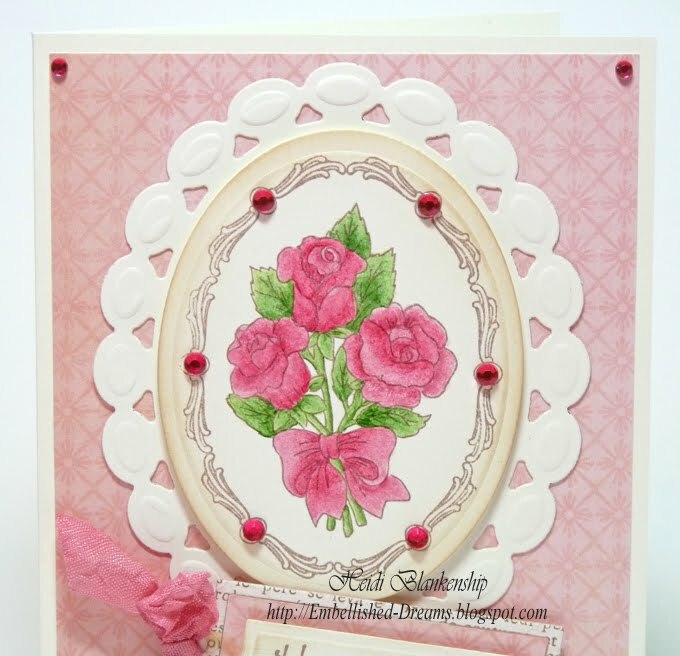 To start I stamped the rose bouquet image from JB-09265 The Greatest Joy Set using Rich Cocoa ink and Simply Smooth Ivory cardstock. Next I colored the roses and bow with Copic markers. 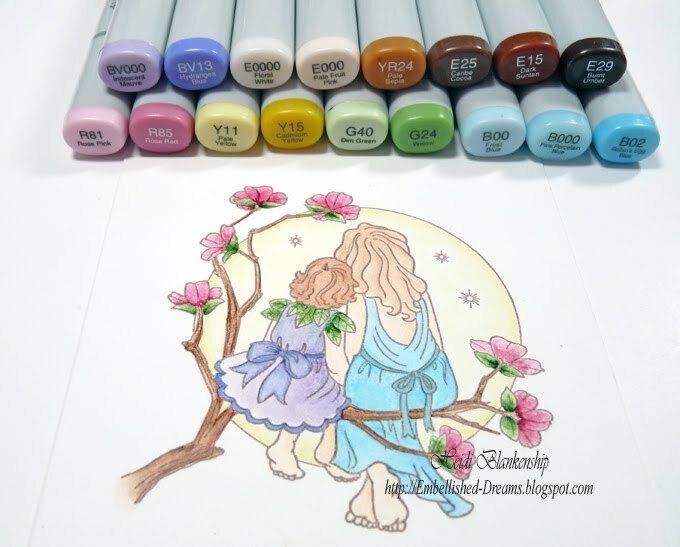 Then I added color to the leaves and stems with Copic markers. Here is a close up of the roses. 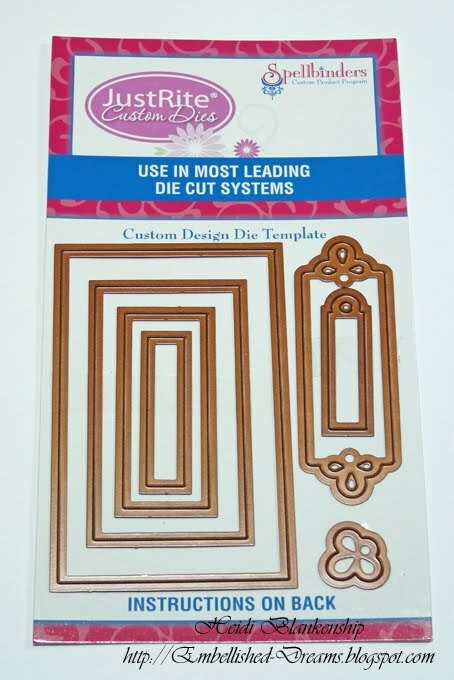 I used the Grand Calibur™ and S4-112 Classic Ovals Small die #5, S4-294 Beaded Ovals die #4 from Spellbinders™ to cut/emboss the shapes. I used Vintage Photo ink and inked the edges of the classic oval. Then I layered the two diecuts using 3D Foam Squares from SCRAPBOOK ADHESIVES by 3L™ and added rhinestones from My Mind's Eye Fine and Dandy Tickled Pink Bling. To create the tag I used a sentiment, 2 dies and the mini clear stamper from JB-09820 Happy Everything Tag Making Kit. 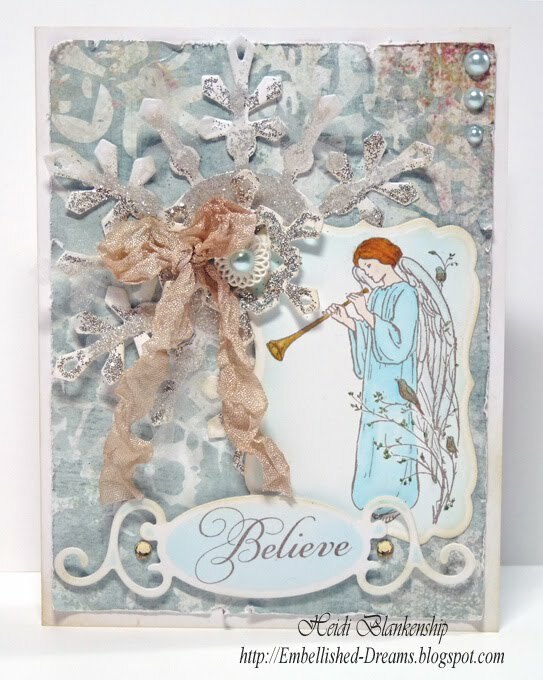 For the sentiment I used Simply Smooth Ivory cardstock from DCS. For the tag I used My Mind's Eye Lost & Found Madison Avenue "Girlfriends" J'adore Paper. Here is a close up of the tag. For the base of the tag I used My Mind's Eye Lost & Found Madison Avenue "Girlfriends" J'adore Paper, the tag die template will cut/emboss two shapes the center and outline of the tag. I turned the center piece to the other side of patterned paper and taped it in place. Then I added the sentiment using 3D Foam Squares from SCRAPBOOK ADHESIVES By 3L. 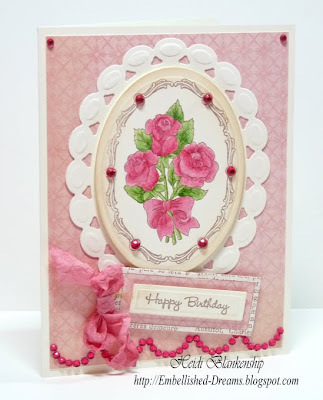 I added scalloped rhinestones to the bottom of the card and a couple rhinestones in the top corners from My Mind's Eye Fine and Dandy Tickled Pink Bling. I also added crinkled seam binding that I tinted with Glimmer Mist. Thank you so much for stopping by today! 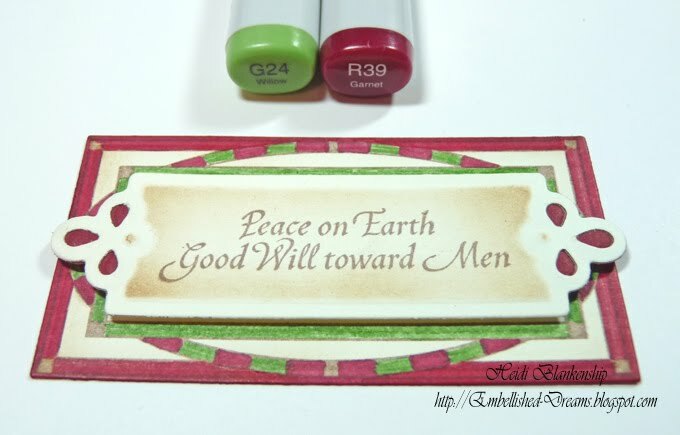 To see more wonderful samples with the New products from JustRite Stampers click HERE to visit the JustRite Stampers Inspiration Blog. Hello! 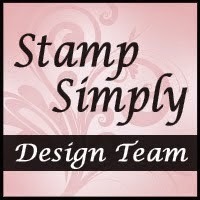 Today, I have a card to share with you using one of the New JustRite Cling stamp sets from JustRite Stampers. The stamp image of the little fairies, wings and the sentiment are from CL-02050 Quiet Moments stamp set from JustRite Stampers. To start I stamped the image using Tuxedo Black ink and Simply Smooth White cardstock from DCS. 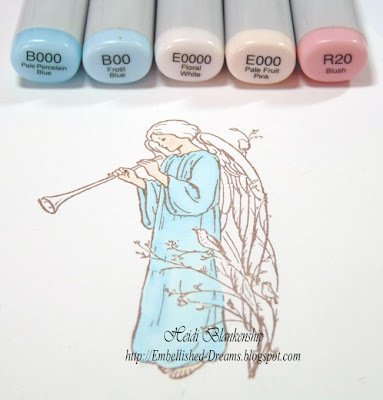 Then I added to coloring with Copic markers. 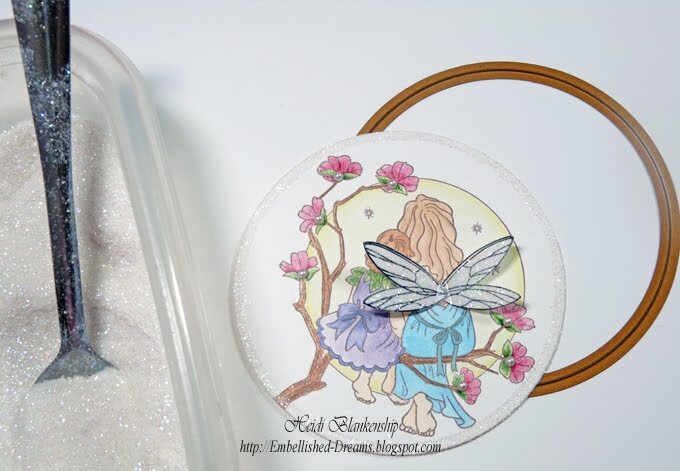 I wanted to make some wings for one of the fairies so I stamped the larger fairy wings from CL-02050 Quiet Moments stamp set using StazOn ink and stamped onto a piece of White Iris Shimmer Sheetz from Elizabeth Craft Designs. Then I hand cut the wings. Next I used the Grand Calibur from Spellbinders and S4-114 Standard Circles Large die #7 to cut/emboss the circle. Then I added pearls to the flowers, wings and glitter. Here is a close up of the fairy image and wings. I also added a diecut for a mat in the background. 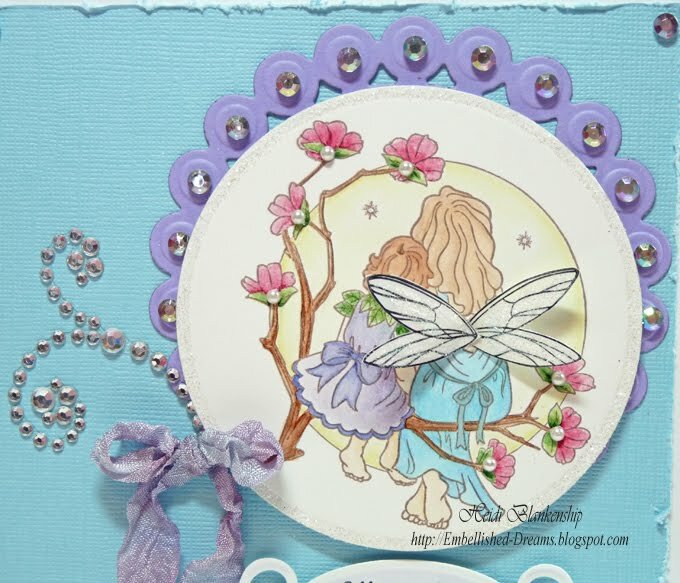 I used the Grand Calibur and S4-292 Beaded Circles die #4 to create the diecut and Violet Sorbet cardstock from DCS. I added rhinestone on the beaded circle diecut, swirly rhinestones and crinkle seam binding. I added color to the seam binding with a mixture of Glimmer Mist colors. For the sentiment I used Tuxedo Black ink and Simply Smooth White cardstock from DCS. I used one of the tags from S4-235 Fancy Tags and then airbrushed with a Copic marker. Here is a close up of the sentiment. Rhinestones were also added to the corners of the card. 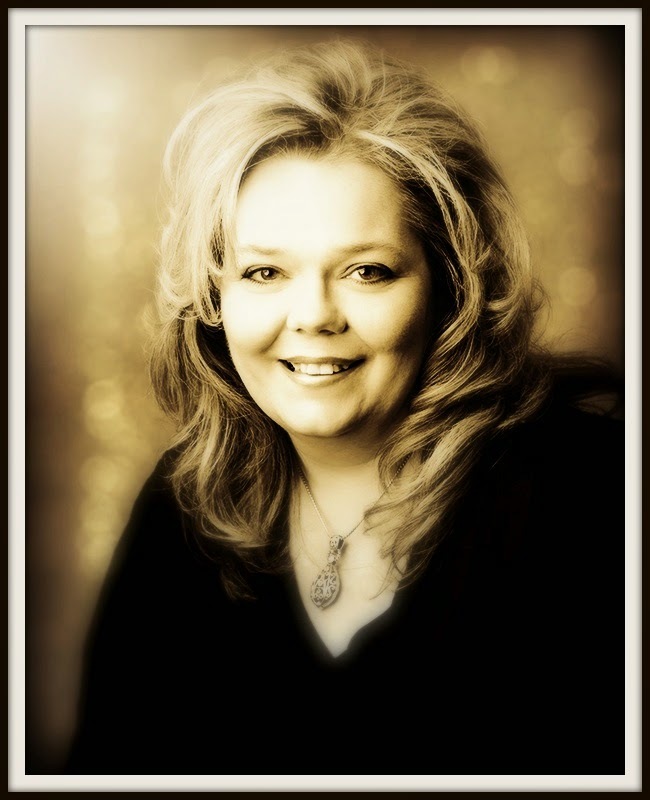 On a more personal note I want to thank all of you who visited the Spellbinders Blog and left all of the wonderful comments!! Thank You So Much!!! Today I am doing my blog post from my New Laptop!! Santa was very good to me!! *wink* I just have to say I am LOVING it!!! Good morning! Just a quick post here to let you know I have a Guest Designer spot on the Spellbinders Blog today. I will be helping out with a few post while they are busy behind the scenes getting ready for CHA in January. The project I am sharing today has a full tutorial on how you can dress up your favorite bottle of Spirits. 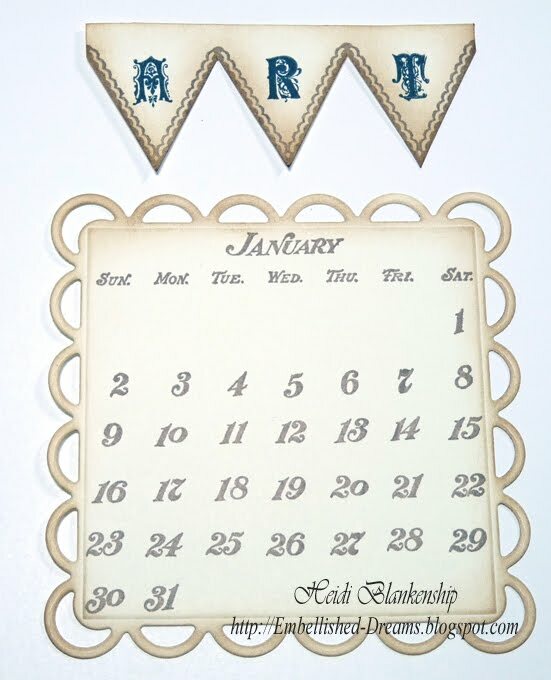 It will make the perfect hostess gift when your heading out to celebrate New Years Eve. Here is a little sneak peek. 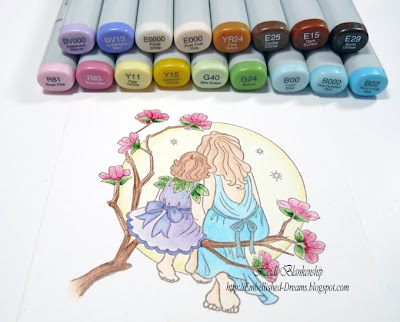 To see the full tutorial and get all of the details click HERE. Thank you so much for stopping by and I hope you have a Fantastic Day!! OMGosh I can't believe it's almost Christmas!! The last couple of days have been flying by! 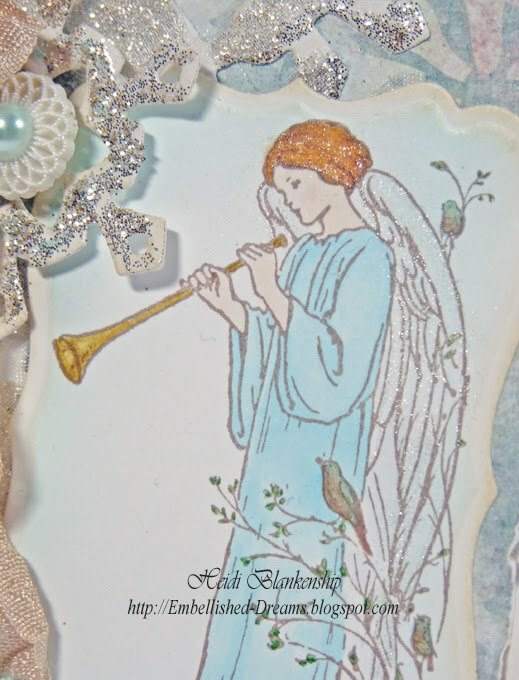 Today, I have another Christmas card to share with you--I'm trying to get them all in before Christmas--LOL! It's very simple but a classic Christmas card. Do you see some NEW diecut shapes on this card? 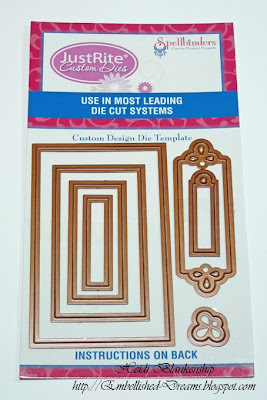 JustRite Stampers has designed their own Custom Dies Templates that are created by Spellbinders™! Now you will be able to custom match the many different stamp designs from JustRite with die templates. 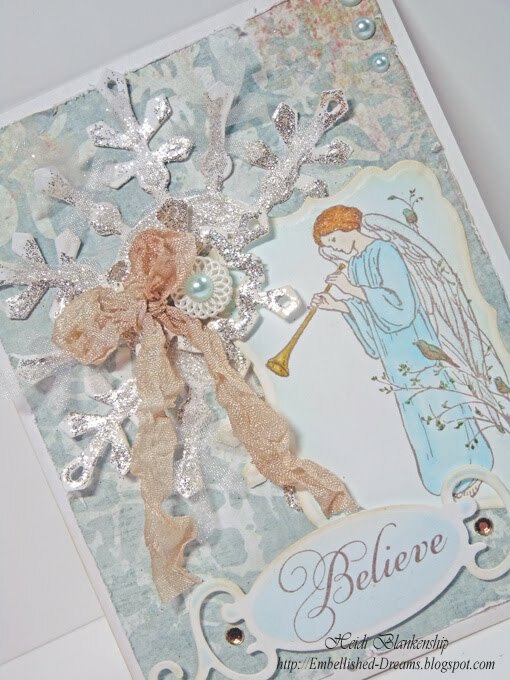 I used JB-08950 Nested Frame Dies and JustRite Cling CL-02030 Simple Blessings to create this card. 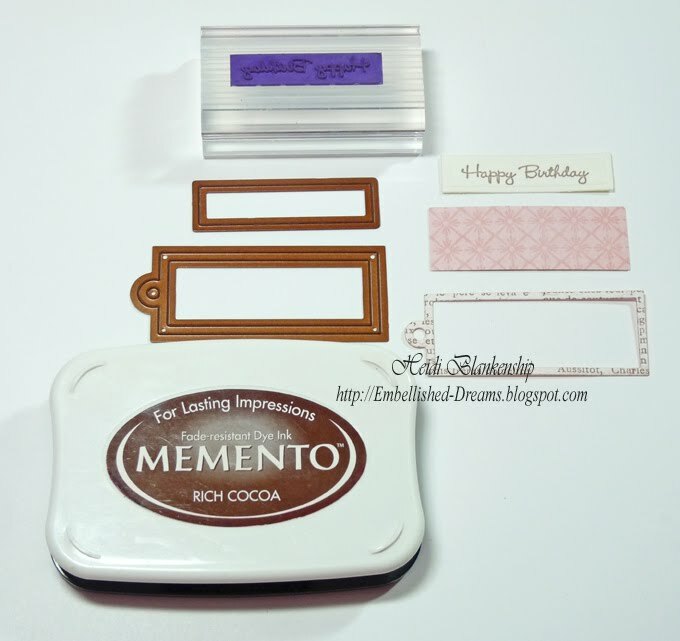 To start I stamped the stain glass window image and the sentiment from CL-02030 Simple Blessings with Tsukineko Memento Rich Cocoa on to DCS Simply Smooth Ivory cardstock. 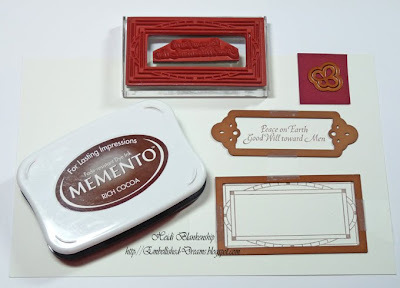 Then I taped the die templates in place and and cut/embossed using the Grand Calibur from Spellbinders™. I colored the image with Copic Markers and then inked the edges with Vintage Photo Ink. 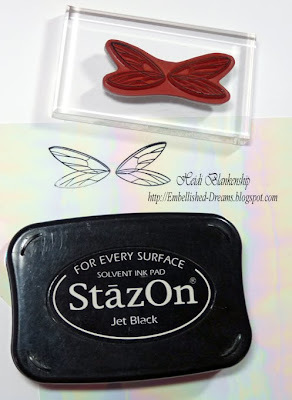 I added 3D Foam Squares from SCRAPBOOK ADHESIVES By 3L™ to add a little dimension. Here is a close up of the sentiment. For the larger rectangle diecut I used JB-08950 Nested Frame Dies, die #4 with DCS Herbal Garden Medium Prismatic cardstock. I stamped some holly leaves and berries in the corners and colored with Copic markers. Then I added some ribbon with a bow and rhinestones. 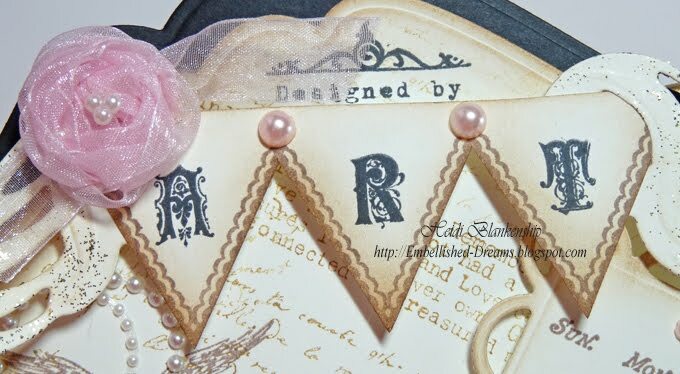 Accessories: Spellbinders™ Grand Calibur™; DCS Dark Red Ribbon Two Tone; Joann's Green Rhinestones; SCRAPBOOK ADHESIVES By 3L™ My Stik™, White 3D Foam Squares. Thanks for stopping by today! I am off to do some more baking with the little guy. I hope you have a Fantastic Day!! Good Morning! 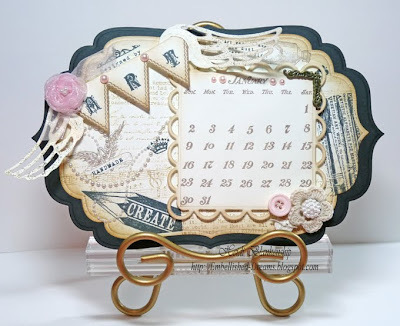 Today is the Crafty Secrets monthly Design Team Challenge and for December our challenge was to create something with a calendar or a calendar theme. I decided to create a calendar for January and what better way to start off the year with something I love--ART! I had so much fun creating the January calendar! 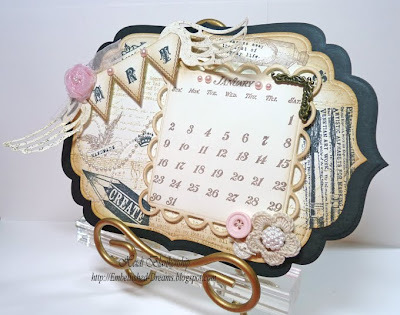 I used three stamp sets from Crafty Secrets Artsy Banner, Art Studio and Calendar. I know there is just a little pop of pink for the color but my favorite combination is the ivory, browns and black. To start I made a label diecut using the Grand Calibur™ from Spellbinders™ and LF-190 Grand Labels Four die #5. 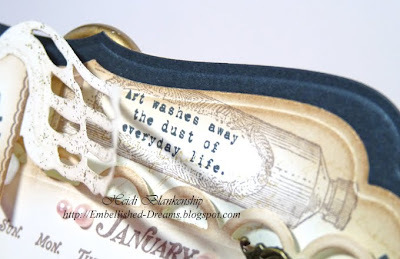 I used Artsy Banner and Art Studio stamp sets from Crafty Secrets to create a background collage. 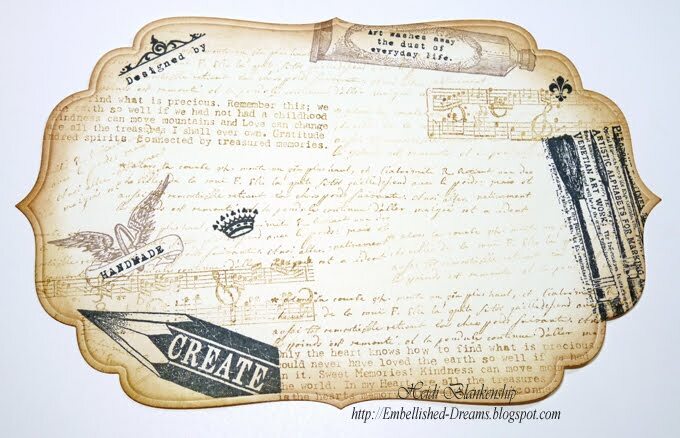 I used Simply Smooth Ivory cardstock with Tuxedo Black, Rich Cocoa, Vintage Photo and Brushed Corduroy inks. 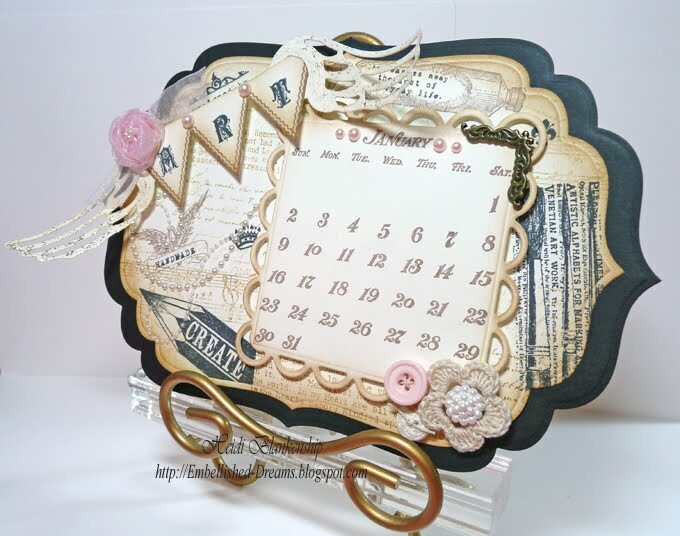 Next using the Calendar stamp set from Crafty Secrets I created the calendar for the month of January. 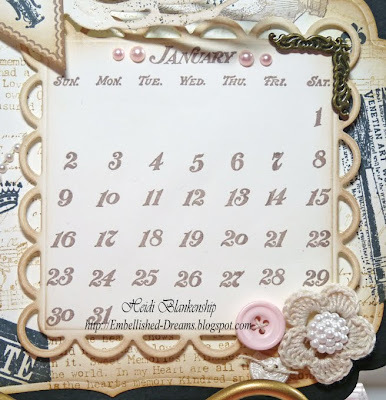 The great thing about the Calendar stamp set is that the numbers are all individual stamps so you can custom create your calendars. 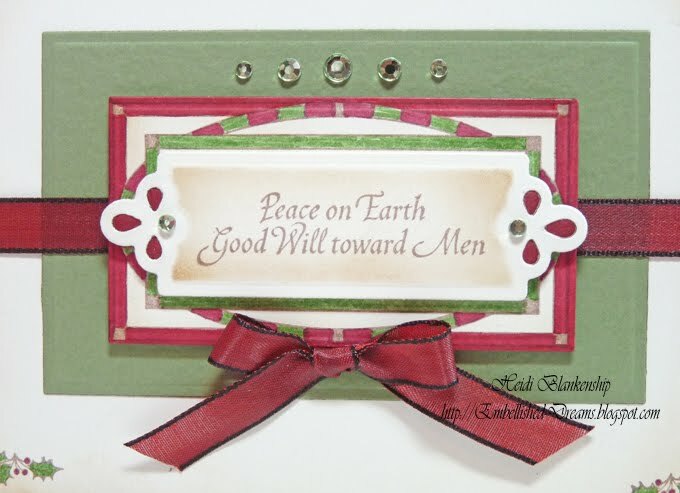 I used S4-295 Lacey Squares die #5 from Spellbinders™ to create the diecut. 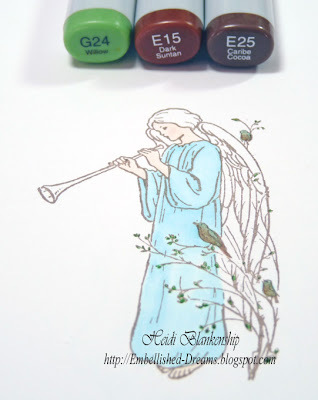 I also created an ART banner using stamps from the Artsy Banner stamp set. Here is a close up of the calendar. For the numbers I used Rich Cocoa ink and I used Vintage Photo to ink around the edges for the lacey square diecut. I added a fancy corner accent, buttons, a crochet flower and pearls. To add a little dimension I used 3D Foam Squares on the calendar. Here is a close up of the ART banner. I added wings, brushed with gold glitter to the ART banner. To create the wings I used the Grand Calibur™ from Spellbinders™ and S4-299 Fallen Angel. 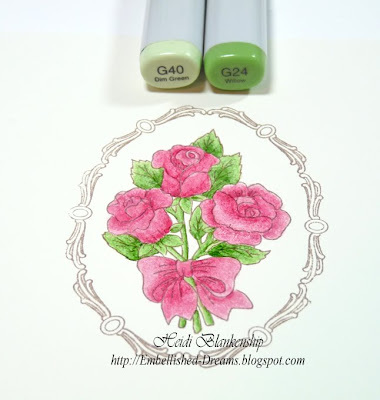 I also added a ribbon rose (click HERE for the tutorial) and pearls. I added some swirly pearls. 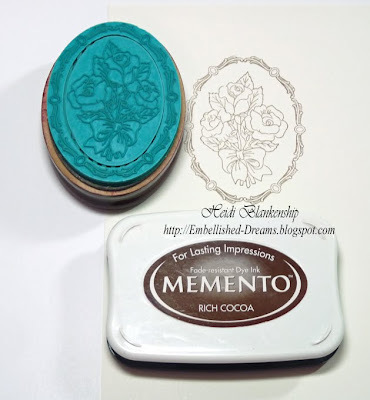 I love this quote and the stamp fits perfectly on the label for the tube of paint! 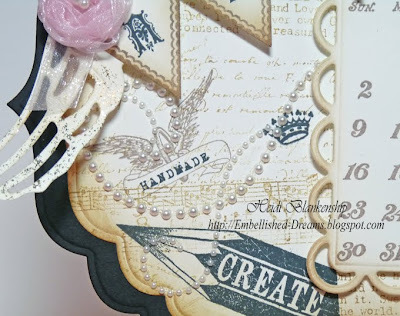 Please be sure to check out the other Crafty Secrets Design Team Members and see what they have been busy creating! 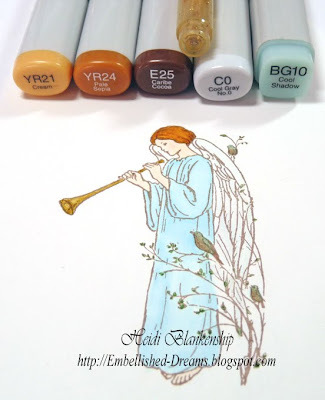 Thank you so much for stopping by today and I hope you enjoy the challenge for this month. Have a Fantastic Day and stay warm! It's snowing again in MN!! Good morning! 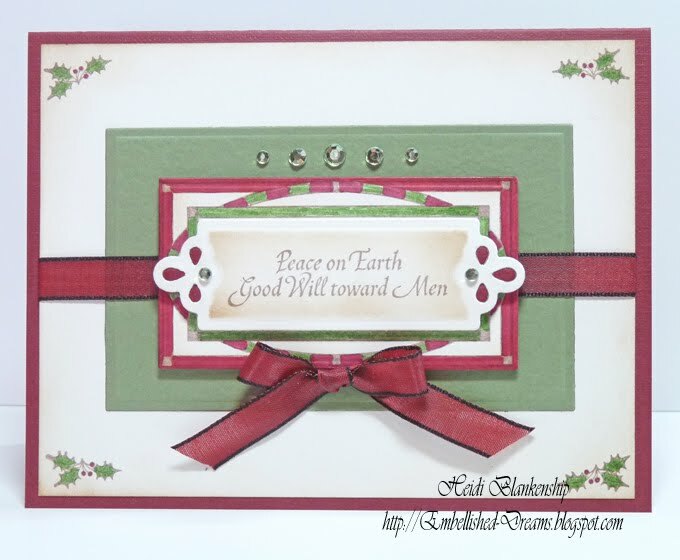 Today, I have a Christmas card to share with you using Spellbinders™ die templates and a NEW stamp set from Crafty Secrets, Angel Blessings. 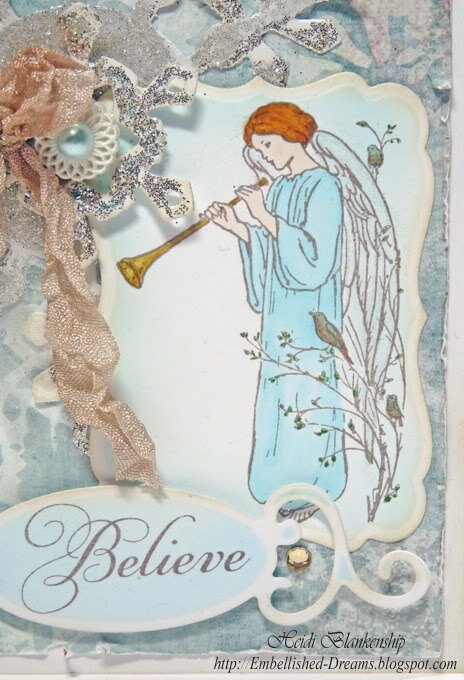 The Angel Blessings stamp set is Beautiful and is full of images of Angels and sentiments. 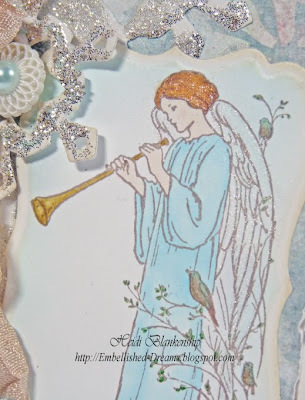 The Angel image on my card is one of my favorite images from the stamp set. To begin I stamped the image with Rich Cocoa ink on to Simply Smooth White Cardstock from DCS. Then I started adding color using Copic Markers. For the second step I added color to the birds and the leaves. Lastly I colored the hair and horn. 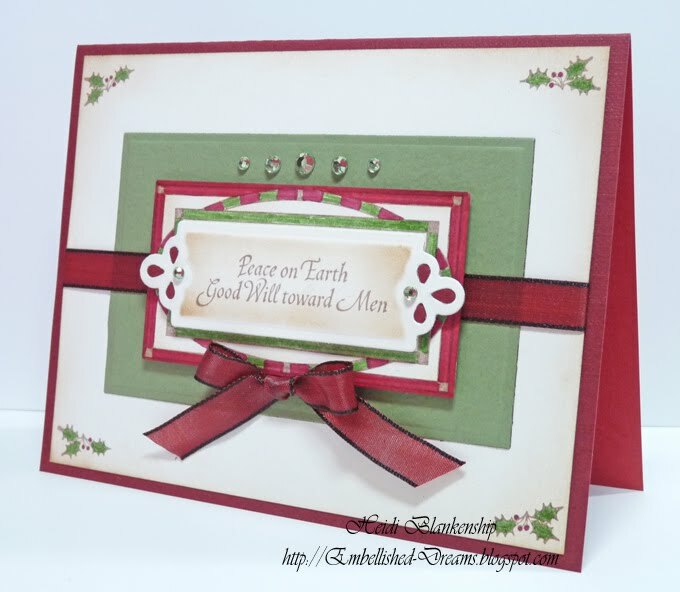 I used the Grand Calibur™ from Spellbinders™ and S5-025 Labels Seventeen die #3 to create the diecut. 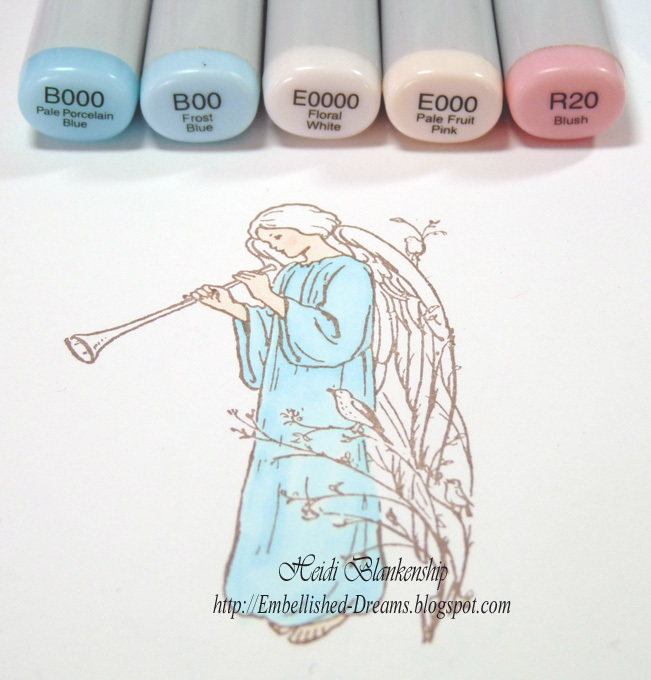 Then I airbrushed using a Copic marker and inked the edges with Antique Linen Distress Ink. Using a Clear Star Glitter Pen I added glitter to the wings and hair of the angel. For the sentiment I stamped the word Believe and then used S4-235 Fancy Tags to create the diecut. 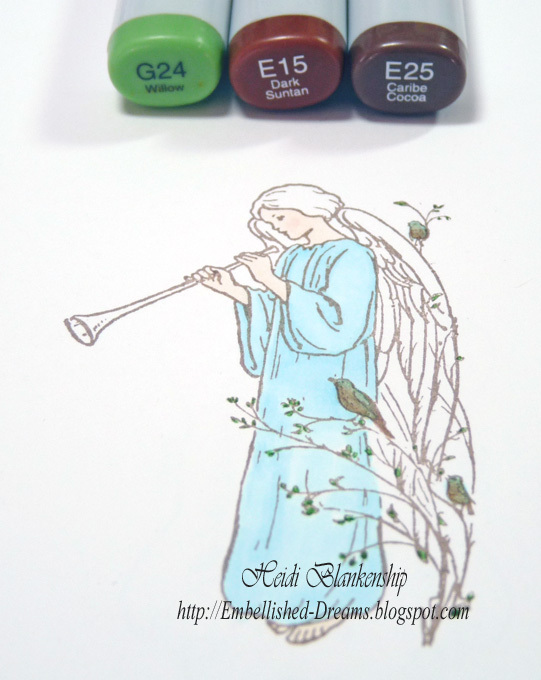 I airbrushed with a Copic marker and inked the edges with Antique Linen Distress Ink. 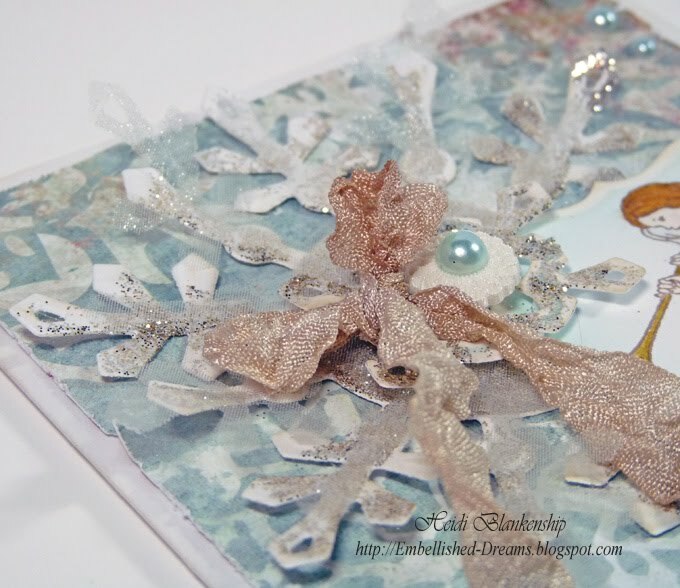 I added 3D Foam Squares from SCRAPBOOK ADHESIVES By 3L™ to add a little dimension to the tag and added a couple rhinestones. To create the large snowflake I used S4-286 2010 Snowflake Pendants. 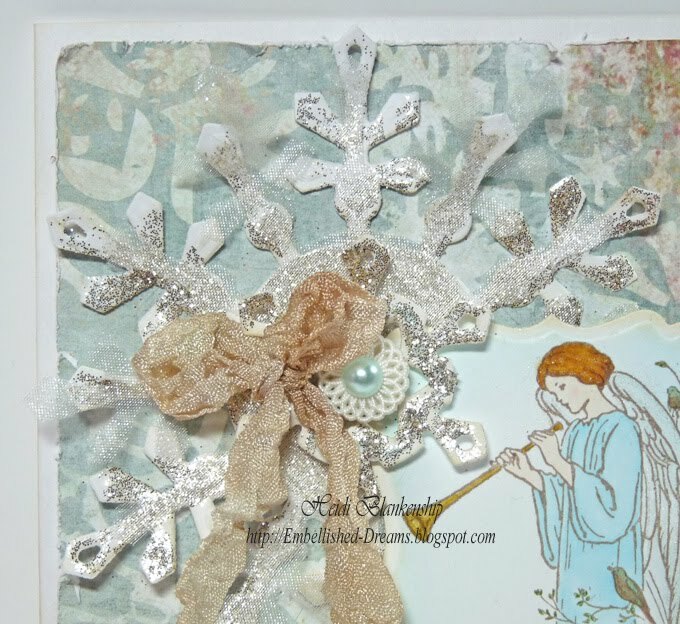 The bottom snowflake is cardstock with Antique Silver Glitter added and the top snowflake is white sheer material. 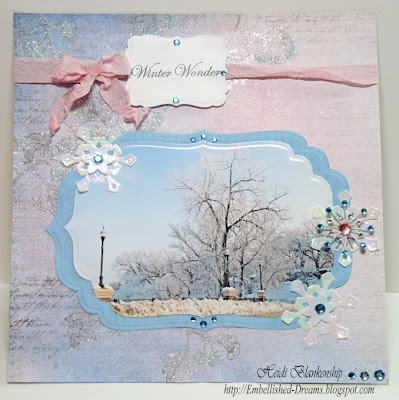 I layered the two large snowflakes and added a smaller one to the center. I also added crinkle seam binding and a decorative button with a pearl. In this close up photo you can see the sheer material. Today is going to be all about baking and it will be a good day for it--it's snowing again so it's a good day to be inside!! Thank you so much for stopping by! Stay warm and have a wonderful day! !